As far as ships go, it would be a challenge to find a more entertaining story than that of the Batavia. 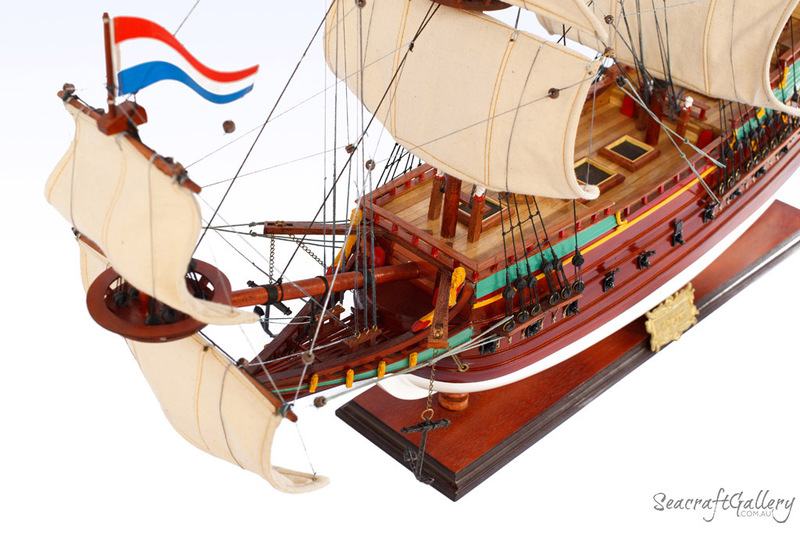 This is why the Batavia is among our most popular wooden model ships. The Batavia is a ship with a revealing, treacherous history, which to this day is still being revealed and expanded upon. It’s a sailing relic; one that, since it was first built in 1628, became an essential part of naval story-telling. It’s today the perfect example of what happens when a bad plan is hatched, and what people will do when their worst plans come unstuck. The Batavia, then, may have been a success in its original mission – but how it came to be a success is one of the most enthralling stories in naval history. With a rich backstory and a story which his perfect for detailing the pressures of life at sea, the Batavia could have a movie made about it. 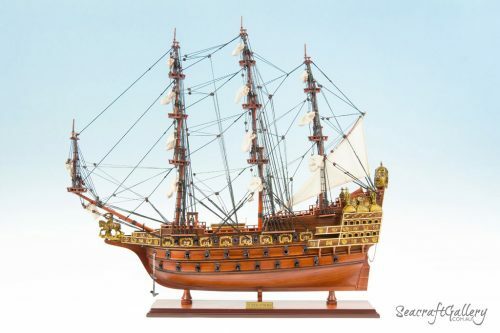 If you are looking for a ship model that feels entirely different to the rest, then, this may be the one for you. 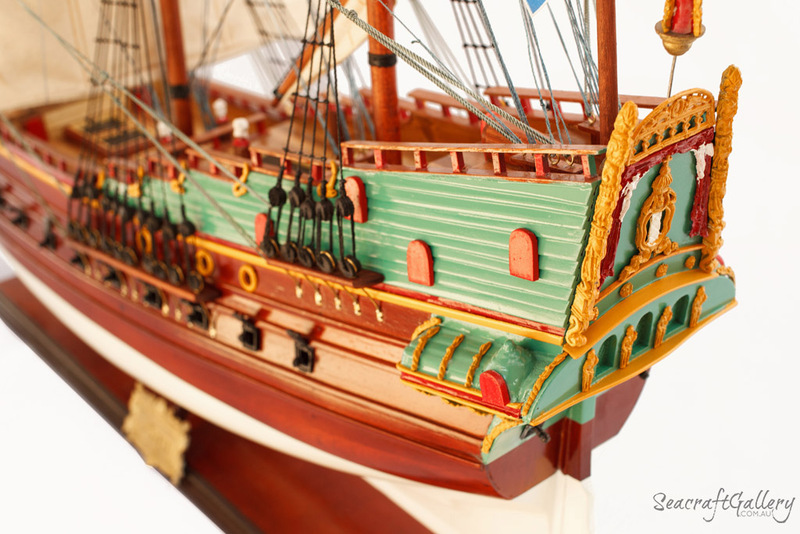 Meticulously handcrafted and painted, this 95cm Batavia model ship in 1:60 is a fantastic choice of your nautical décor theme. 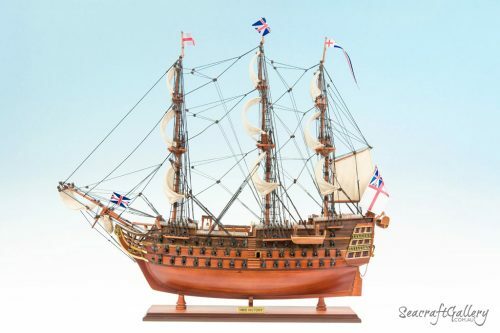 An authentic on the Batavia using impressive scaling and planning for immense accuracy. 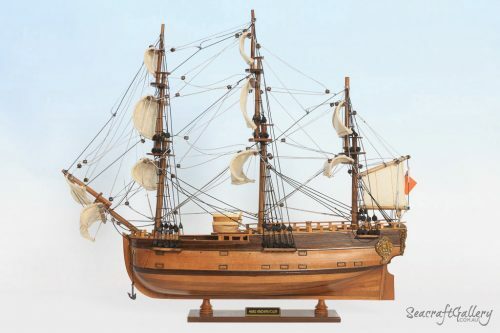 A 1:60 scale Batavia model ship, made at 95 x 20 x 78cm (other sizes available). Fully assembled and ready to be put on display direct on arrival. 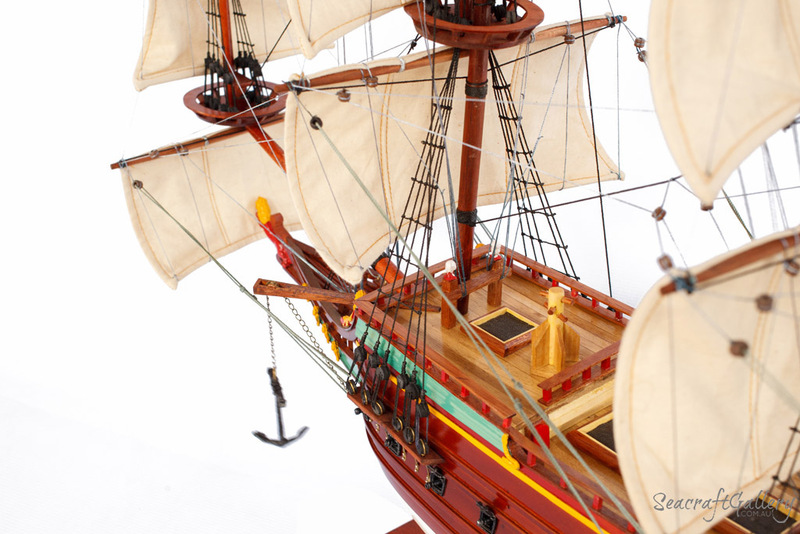 Hand-built using attention to detail and choice of material for the most realistic ship model. Designed to help adjust and move with changes in the climate, improving lifespan. Wood used when it should be, and metal used for things like cannons, muskets and anchors. Gun ports accurately cut into the hill, not just stuck on, for best effect. Realistic decking, including the introduction of impressive lifeboats – with oars. 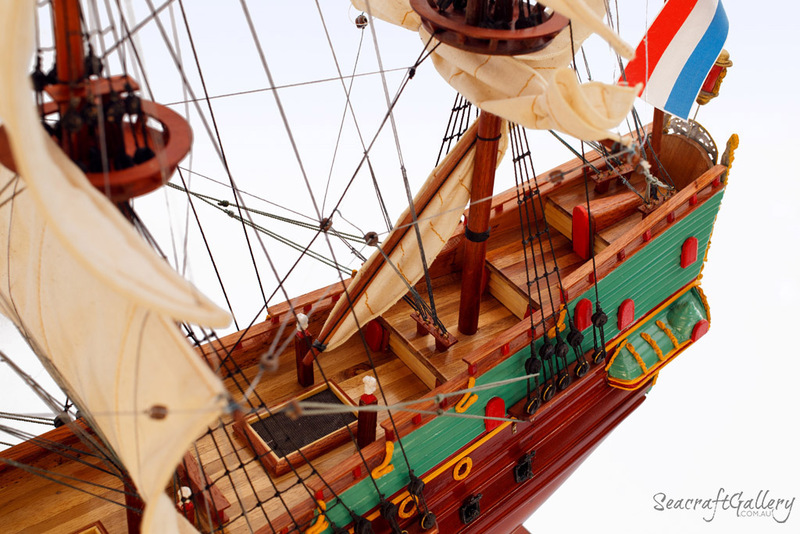 Comes with a strong, sturdy wooden base perfect for putting your ship model on display. 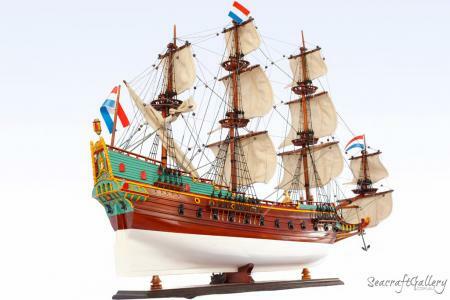 Metal name plate included and a history certificate of the Batavia model ship also included. 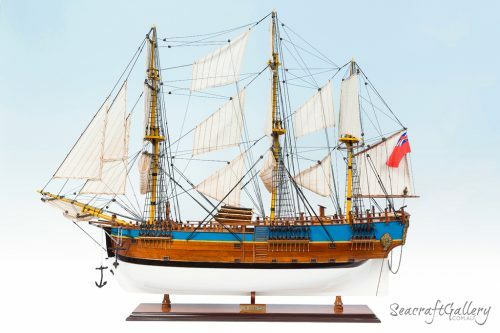 It would be more impressive to display your Batavia model in a hardwood & perspex display cabinet specially designed for tall ship replicas. 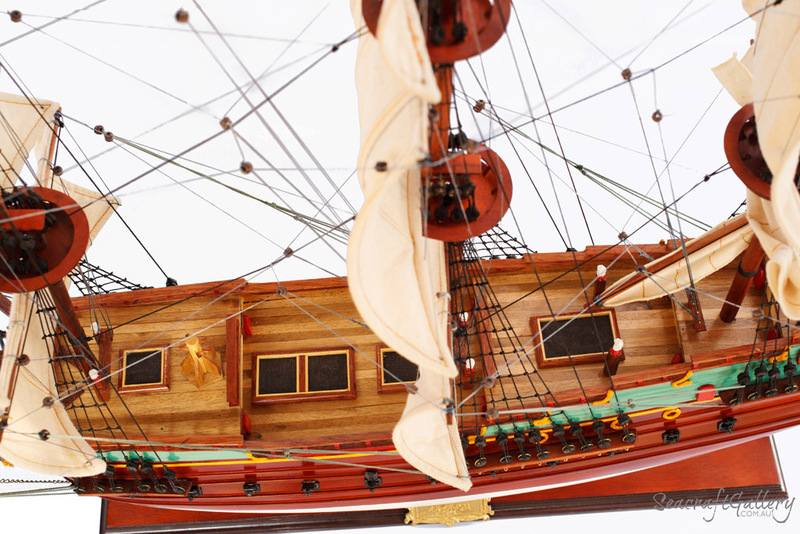 As one of the most important naval ships of its era, the Batavia first came to be in October 1628. It was built by the Dutch East India Company, and was used for the collection of spices. 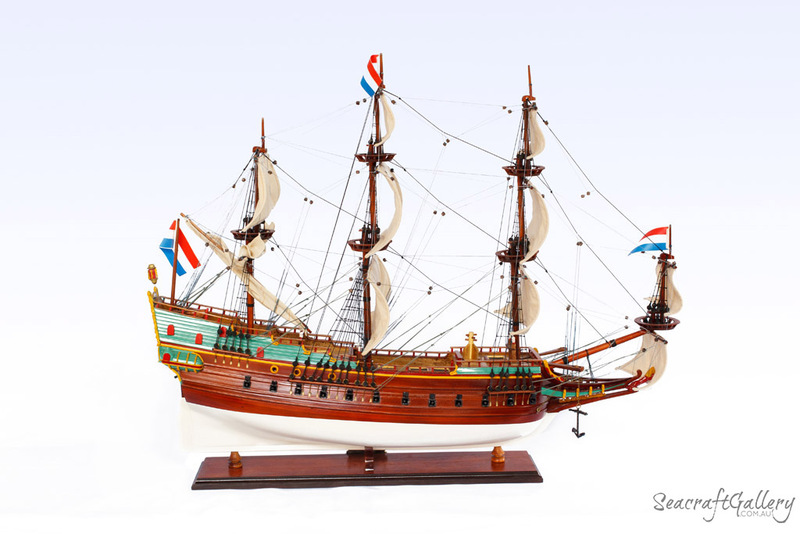 Under the command of Francois Pelsaert and Adriaen Jacobsz, the ship was a major part of the success of the ear. Another person onboard was that of Jeronimus Cornelisz, a pharmacist on the run due to ‘heretical’ thinking. Cornelisz and Jacobsz came up with the daring plan to try and steel the ship, starting a new life elsewhere. Jacobz deliberately sabotaged their direction when leaving South Africa, steering the ship off course from the rest of the fleet. By forcing a mutiny with other members of the crew, they attempted to force Pelsaert into disciplinary action and thus a mutiny. This did not work, though. Eventually, in June 1629, the ship hit a reef not far from Beacon Island, which is close to the present Western Australian coast. Sadly, many drowned when escaping to the nearby islands. The islands produced little by way of survival aids, so a group of the passengers – Pelsaert, included – set off to find water via longboat. Eventually, they headed to the city of Batavia (modern day Jakarta), and took over 30 days. Pelsaert returned to save everyone else from the crash, arriving nearly two months after first leaving Batavia. What he found, though, was something from a nightmare. Cornelisz and Jakobsz had managed to kill as many as 125 of the people left behind, indirectly, using their influence to convince others to do it for him. A great battle ensued, and the combined forces of Pelsaert and those still fighting off the mutineers won. The worst offenders were executed on the island, while the rest were tried in Batavia – apart form a duo of sailors who were left behind. Though Jackobsz managed to avoid execution, it’s likely he died in prison. The port of Batavia, then, was supposed to house 341 people aboard the ship. In total, just 68 made it back. After all was said and done, the ship was returned to the Dutch in 1656, never to serve as a host for a major journey again. The wreck of the Batavia was eventually discovered, too, with excavation beginning off the coast of Western Australia in 1972. This large-scale project was among the most ambitious ever undertaken, especially by the Western Australian Museum. What eventually was saved was stored in Freemantle, for the first time since 1629, where relics recovered from the wreckage can be found. Indeed, a replicate of the Batavia was put together at the Batavia Wharf, back in its native Netherlands. This took around a decade, from 1985-1995, before it was transported to Western Australia. Taken by barge, the replica of the Batavia has been stored at the National Maritime Museum in Sydney. Amazing product!!!! Above and beyond customer service too! EXCELLENT!!!! Excellent item!!!!! Top quality and detail !! Thank you!!!! !